October 18th was our National Feral Cat Day event. We had two clinics that day hoping to fix 150-200 cats in one day. Again, last minute stress over cancellations and not filling the clinics sends us all into a spin. I'd had a cancellation for 10-15 cats from someone getting traps from me. Weird thing about this is that he volunteered for the Humane Society and decided TNR would be "too stressful" for the cats. So, thinking we'd have too few cats for the north Phoenix clinic on Sunday, I called a caregiver and told her to "pick up the food right away" - this was Saturday morning. Well, it was like "shooting fish in a barrel" at her place, despite food not being withheld for two days. These cats were hungry for tuna! We trapped 14 cats right away and the cats had been fed. Amazing! Well, we ended up fixing 78 cats in north Phoenix and 107 cats in Tempe for a total of 185 cats. We had met our goal. And, Wayne and Bob Janda came through and trapped at the Peppertree Mobile Home Park (31 cats). Thanks go out to all who contributed financially to this effort - especially those from Phoenix Feral Friends. You guys rock!! Of course there were stragglers from the previous night's trapping. Two were caught overnight. The caregiver set the traps so we were able to go home and relax after working at the clinic all day. Suzie also brought in two from another caregiver who trapped a second night and could not transport on a Monday due to her work schedule. This is often a problem as people have to go to work early and work late. We do our best to help these caregivers and they appreciate our great volunteer service. Every cat is important and I try, often too hard, to help those in need. Unfortunately, some caregivers take advantage of us but that is the price of what we do. We have to put the cats first despite difficult people. I had a trapping job that night in a mobile home park (MHP) I'd trapped at for many years. There were two locations (caregivers) that needed help. I ended up with 13 cats between the two places, and transporting to two different vets. The "mother of them all" was still out there resulting in a sleepless night (I promised myself this would never happen again but it did). A superbreeder on the loose that would have yet another litter if I did not do something! I might mention I had to pick up another cat downtown on my way to the vet. Another stop at the QT. A word about the QT: It seems lately I 've been stopping there in the AM for gas then again in the evening for dinner...not a diet I recommend! Of course those cats needed to be picked up and aftercared (a given). But I had to get the "superbreeder". I did have to also pick up 12 other cats at yet another vet for a caregiver needing assistance. Suzie, if I recall, picked up the other cats at one vet and I picked the four cats at the other vet at 1:00 PM. We just shuffle them around as needed. If that was not enough I had to pick up 12 cats at yet another vet and return them to 32nd St. and Van Buren. I had visited three vets today. I was back at the MHP that evening scouting out that elusive superbreeder. I did manage to catch her with the drop-trap after waiting for nearly an hour and caught one cat overnight for a total of two cats. Now I'd done a total of 15 cats at the MHP. There was one white male cat left but I figured he'd move on where the girls were more cooperative and interested in him. I took in the last two cats to the vet in the AM. I delivered traps to someone I'd helped numerous times down in central Phoenix at the city disabled housing at 22nd St. and Roosevelt. Fortunately this was near the family homeless shelter where I'd delivered the 12 cats back from the third vet. See a pattern here? We do help a LOT of caregivers needing not only trapping assistance but financial assistance...at homeless shelters, disabled housing projects, and other low-income areas. 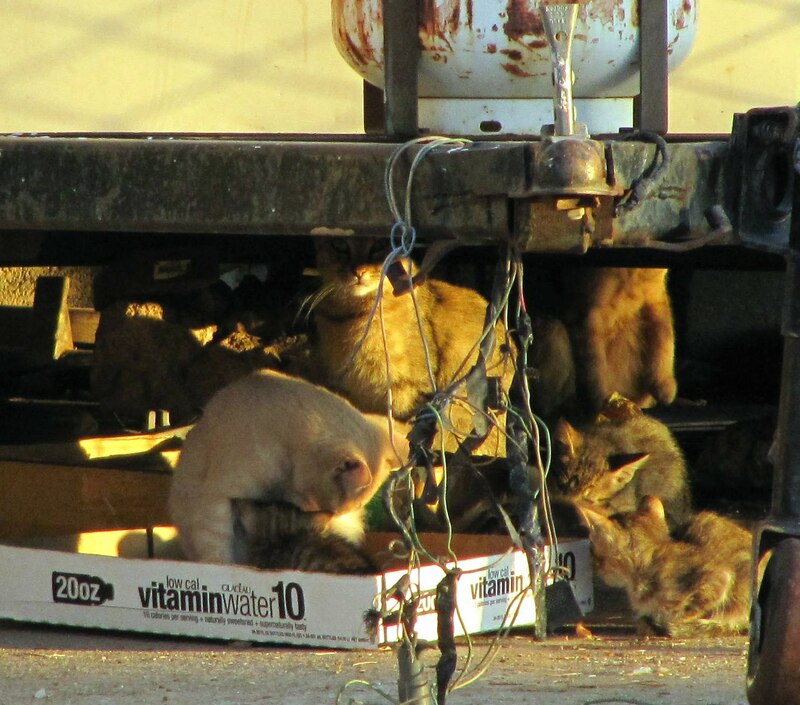 This is where the greatest number of cats are because people in these areas cannot afford to S/N their cats. The caregiver at the disabled housing uses a motorized wheelchair as do many in the complex. Please consider a donation to help not only cats in need but the caregivers in need as well. Consider adonation to ADLA as part of your holiday giving. It goes a long way to help cats and people too. Got up very early to release that last two cats at the MHP. Then, I picked up three cats at the Phoenix housing complex and six from another place I was transporting. I have a friend who often finds caregivers who will trap but cannot transport cats to and from the vet. Today I'd have a total of nine cats at two different vets. I'd also have the usual pickup and aftercare. However, it is now getting cooler so aftercare is much easier. I released all the cats at all the locations in the AM. There would be no second night trapping. I did, however go by a location near the Phoenix disabled housing project that had 20+ cats needing help. This photo is of some of the cats before being fixed. This would be next week's trapping job - abandoned house and of course, no donation. Next week - See what these cats look like after they are fixed! Now off to the vet with the superbreeder and her cohort.